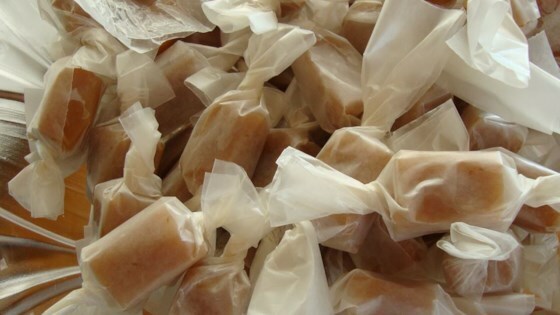 "These caramels are made with brown sugar, cream, butter and corn syrup and flavored with a hint of vanilla." Combine brown sugar, white sugar, butter, corn syrup, cream, milk and vanilla in a medium saucepan over medium heat. Heat, stirring occasionally, to 250 to 265 degrees F (121 to 129 degrees C), or until a small amount of syrup dropped into cold water forms a rigid ball. Pour into an 8x8 inch pan. Let cool before cutting.